Last year we announced the launch of local news in the U.S., and this week we launched this feature of Google News to users in the UK, India, and Canada. Local news sections let you keep track of current events in your area. We analyze every word in every story to understand what location the news is about and where the source is located. The top stories for a given area will be at the top of your results, and our rankings also take into account a publication's location to promote local sources for each story. Once you've clicked the link, you'll see a place to enter a postal code or city. Use the drop-down menu to choose the number of stories you'd like to see. 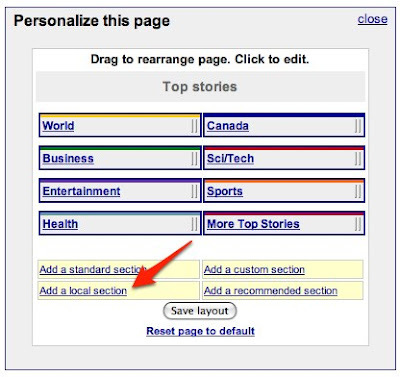 To finish, click "Add Section" and you'll see this local section on your personalized Google News page. As always, we're working to improve our product, and we appreciate your feedback.